Just like you, I am always searching for good recipes. Especially for the things that we did not cook at home in Turkey but would rather purchase it from local bakery shops or restaurants. Things that I didn’t think twice when I had easy access to it, but then I felt like banging my head on the wall when I can not find it so instantly anymore or its recipe for that matter. So when I find a recipe, I hold on to it with my dear life. Açma is one of those pastries that I had been looking for a good recipe. 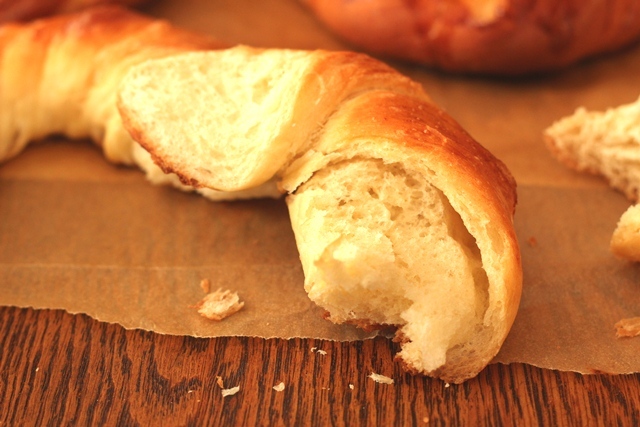 This soft and buttery pastry reminds me of croissants. 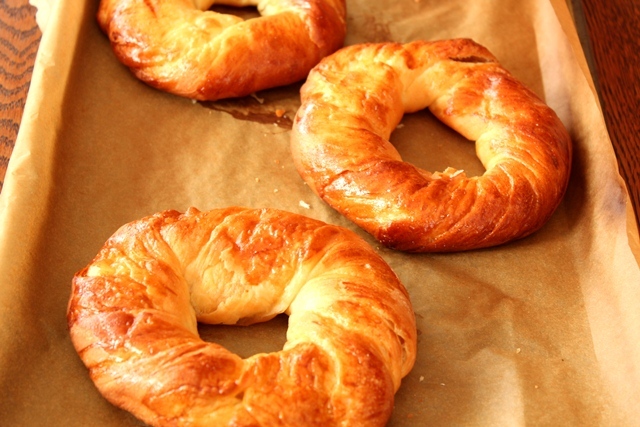 Unlike croissants though, these are shaped like simit. 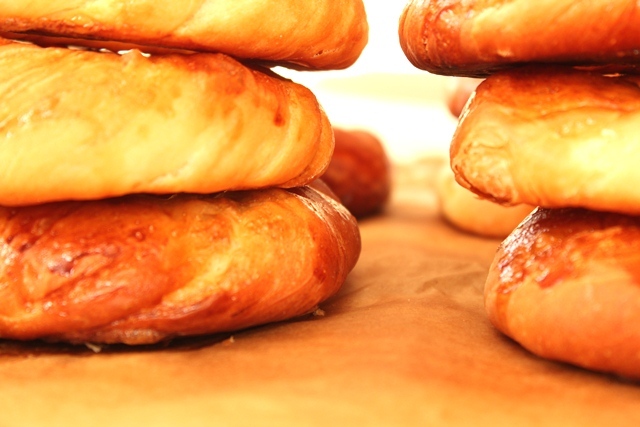 The flaky pastries line the bakery windows early in the mornings. 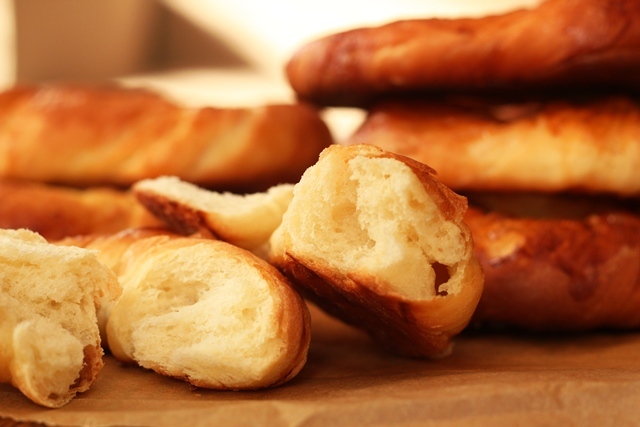 Just like simit or pogaca, it is one of the most common on-the-go breakfast items for many Turkish people. But if I am enjoying my açma at home, then I like to spread some black olive paste or tasty homemade jam on it. I found this recipe in Ayla Algar’s book, Classical Turkish Cooking. They turned out good, were delicious to eat with a cup of tea but I don’t think this is “THE” recipe for acma. One thing I will change next time I try this recipe is to divide the dough into 8 rather than 12 to give each piece little bit more meat. Right after I baked these, my mom called me to say that she had finally found a good recipe for acma! What a timing! A little late for this party! I thought about making her recipe as well and compare the recipes side by side but then decided to wait a couple of weeks. The cholesterol levels in this house do not allow two back-to-back butter loaded recipes – especially after Thanksgiving! If you make these, hope you enjoy with a glass of tea and some homemade jam. As far as the jams/marmalades go, my favorite one is quince jam or marmalade. I love eating this fruit raw as well. One of my favorite bloggers, Lana, made this quince paste the other day, and I have been looking for quince in the stores since then but I have not had any luck. In case you are lucky enough to find it, I highly recommend it! 1. Dissolve sugar in 1/2 cup of warm water. Sprinkle yeast over it, give it a stir, set aside for 10 minutes and wait until yeast becomes foamy. 2. Sift the flour in a big bowl. Add salt. Cut 4 tablespoons of butter in small pieces and add to the flour. Add yeast mixture, egg and 1/2 cup of the warm water. Combine everything well with your fingertips and add the remaining 1/2 cup of warm water gradually until a soft dough forms (adjust the water amount – less or more – based on the dough’s condition). The dough should feel a little bit sticky. 3. Turn it onto the floured countertop and knead for 10 minutes. 4. Put it in a lightly oiled (with vegetable oil) bowl, cover, set aside for 30-40 minutes. 6. Roll each piece into a ball. Cover, let it rest for 15 -20 minutes.Take 6 tablespoon unsalted butter out of the fridge, cut into half tablespoon sizes and set aside to bring it to room temperature. 7. Press each ball into a 6-inch circle. Spread half a tablespoon of butter over the circle. 8. Stretch the circles into 12 by 6 inch rectangles, while spreading the butter with your fingertips as well. It should be very thin sheet of dough. Fold the dough in half, keeping the butter inside. Should be 6 inch by 6 inch now. Fold it in half two more times (3 by 6 inches and 1.5 by 6 inches). 9. Roll it into a cylinder, 6 inches long.Let it rest for another 20-30 min. 10. Line baking sheets with parchment paper. Make each cylinder into a 12 inch log by stretching. Twist each log several times around itself and bring the ends together to make a circle. Put it on baking sheets, set aside for 30 min. 11. Brush with the egg wash once. Let it rest for 5 minutes. Preheat the oven to 375-degrees. Brush with the egg wash again and bake for 20 minutes or until golden brown. I could just smell this coming out of the oven! It looks heavenly. I love that you look for recipes for things that you bought in a bakery in Turkey. I’m sure it warms your soul! This looks delicious. I especially like this recipe as it is something new, at least for someone not knowing too much about Turkish bakeries. Let us know how your mom’s recipe works out too! Beautiful rings! They would make a great breakfast with a pot of freshly brewed black coffee! Oh my GOD looks great !! What a nice pastry! I’d love to have some with coffee for breakfast! Oh…good luck on getting those pans! I’m in the same boat myself, so I mostly use stainless steel now. Oh, how I would love to go to Turkey and sample one of those acmas. They looks so warm and delicious. Thank you for leaving such wonderful comments on “Snippets”. Yes, to achieve the low light photos, I almost completely close the blinds to my room and then put my aperture wide open. I have more failures than successes but I’m still trying to figure it out too. Mmmm these look lovely. I like how you said you can have them with olive paste or jam, whatever takes your fancy! I bet they make a wonderful start to the day. I didn’t know you were blog buddies with Esra- I was just on her site and saw your comment. Not that I can read the Turkish language. I just go to Esra’s site to drool. Doi you know she and I went to Le Cordon Bleu at the same time for Basic Patisserie? Anywho, these Acma look divine. I like anything related to a croissant. I’m going to take your suggestion and eat my next croissant with an olive tapendade. Sounds like it would be a terrific combo! Hopefully soon, lately I am having hard time to juggle everything but I am hoping to get my hands in dough soon. Will let you know!